The discovery of gold in the southern Black Hills in 1874 set off one of the great gold rushes in America. In 1876, miners moved into the northern Black Hills. That’s where they came across a gulch full of dead trees and a creek full of gold and Deadwood was born. Practically overnight, the tiny gold camp boomed into a town that played by its own rules that attracted outlaws, gamblers and gunslingers along with the gold seekers. Wild Bill Hickok was one of those men who came looking for fortune. But just a few short weeks after arriving, he was gunned down while holding a poker hand of aces and eights – forever after known as the Dead Man’s Hand. Calamity Jane also made a name for herself in these parts and is buried next to Hickok in Mount Moriah Cemetery. Other legends, like Potato Creek Johnny, Seth Bullock and Al Swearengen, created their legends and legacies in this tiny Black Hills town. Deadwood has survived three major fires and numerous economic hardships, pushing it to the verge of becoming another Old West ghost town. But in 1989 limited-wage gambling was legalized and Deadwood was reborn. Today, the town is booming once again. You’ll find modern-day casinos, resort hotels, full-service spas, big name concerts, and some of the best parties in the entire United States. 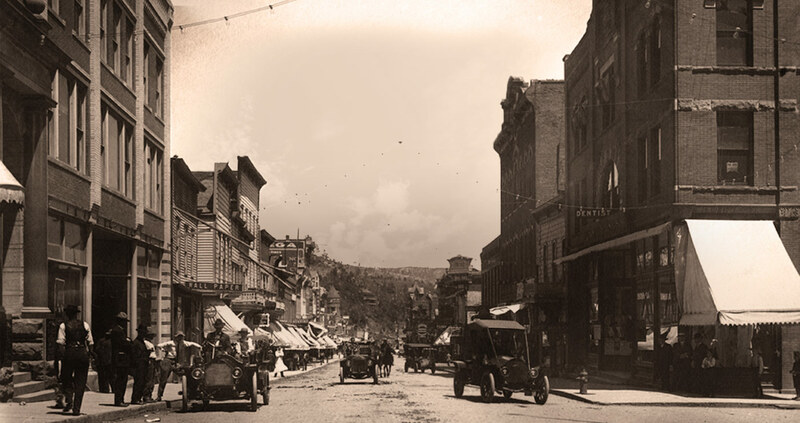 Come walk in the footsteps of our legends and make history in Deadwood. We’ve been entertaining guests since 1876.